We’ve got a real mixed bag of creative goodness for this edition of CreativeEye, with some of the best marketing in May stretching across magazine designs, animation, typefaces, and more. First up, Google unveils a nostalgia-fuelled interactive VR and 360 degree doodle in homage to French illusionist and silent film master George Méliès. Keeping on the subject of film, in light of the recent Infinity War hype, Empire undergoes an Avengers-themed makeover with illustrations channeling 80s-style graphics while the team behind Deadpool 2 release a new trailer. Also making an appearance this month is animal rescue shelter Battersea and its brand redesign to better fit its core values. Check out all of these and more in a round-up of some of the best marketing in May! In commemoration of George Méliès and two of his most well-known films – A Trip to the Moon and The Conquest of the Pole – Google Spotlight Stories, Google Arts & Culture and Cinémathèque Française have collaborated to create a magic-filled two-minute-long interactive 360 piece. Rife with illusionist visionaries and his trademark filmic charm, the art and magic of Méliès is still studied today as famous staples of the silent-era of filmmaking. So, Google’s first ever VR and 360 degree interactive presents a milestone for marketing creativity and technological advancement. The “Back to the Moon” Doodle is two-minutes long and follows an illusionist as he pursues the Queen of Hearts through the stars. “We approached it as if it were a ballet or play you watch at the theatre, where you get to choose where to look. In these situations, the spectator becomes the camera, editing their own film,” said Hélène Leroux, project art lead of the Doodle. Google has truly delivered the magic on this occasion. Even if you’ve yet to see Infinity War, we’re sure you’ll have seen Thanos’ name all over the internet. It began off the back of the film’s instant success, through Twitter memes, and now it’s been announced that he’s making a Fortnite appearance (albeit for a limited time). In keeping with Thanos’ desire to wield the Infinity Gauntlet embedded with all six Infinity Stones, Empire has utilised the talent of vector artist Orlando Arocena to bring an 80s-style edge to this vision. 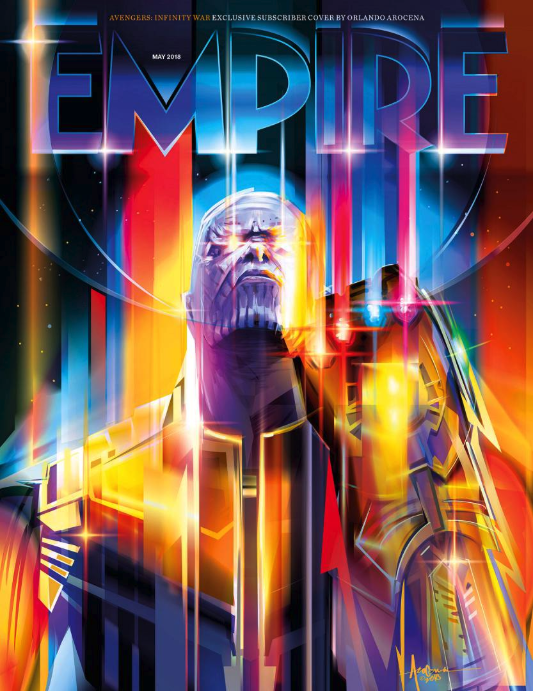 The design for its May issue meticulously alludes to The Infinity Gauntlet comic book cover whilst remaining in keeping with Empire’s style (even using the magazine name’s letters as a focus-point for the six Infinity Stones). If for nothing else, the design is undeniably visually stunning. The integration of braille in everyday society seems few and far between at times. That’s why, when asked about the inspiration behind creating a new braille typeface, Japanese designer Kosuke Takahashi boils it all down to greater inclusivity. 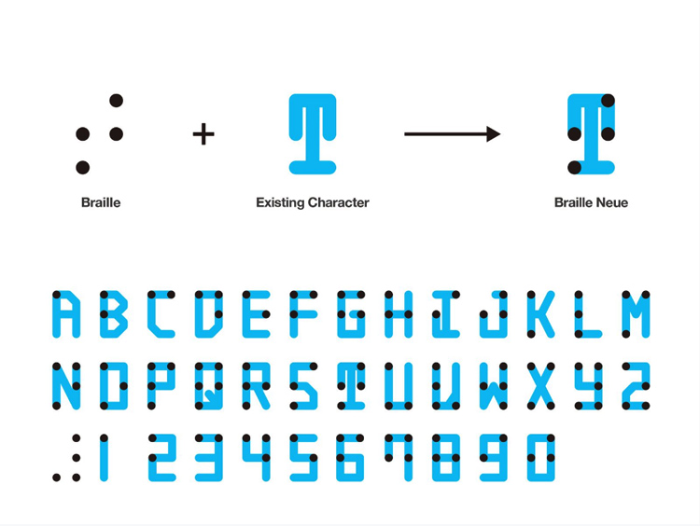 His new braille typeface seeks to cater for the blind or partially sighted, containing both letters and braille dots. His design is a hopeful step towards implementing braille into public spaces, encouraging architects, designers and councils to give more consideration to those who may need it. Takahashi currently has hopes to start conversations with the Tokyo 2020 Olympic Committee. He’s got our backing! The rivalry between Coke and Pepsi is a tale as old as time. So, it comes as no surprise that Pepsi has revamped one of its old marketing lines; “Too Much Taste To Call Ourselves A Zero”. The ad then proceeds to explain its name in a direct attack on Coke Zero: “Maximum Taste, No Sugar”. Brand wars can be a lot of fun and, let’s face it – incredibly entertaining for us to witness. Some of the big-time brands just can’t help themselves, for example Samsung and Apple’s ongoing rivalry, and of course Pepsi and Coke have been in competition for years. Whilst Pepsi may have won this battle, for now, it seems like the war is far from over! It’s no secret that the amount of plastics – and all types of waste, in fact – is causing serious harm to our oceans. We’re sure you’ll have seen a lot of the initiatives launched recently as attempts to combat this issue. Greenpeace is one of the latest to launch a campaign in collaboration with Ogilvy in a bid to raise awareness of the severity of the issue. The video follows a group of children on a school trip as they walk into an aquarium to see an “Ocean of the Future” exhibition. Yet, instead of seeing all of the beauty of sea life, they’re faced with single-use plastic items like bottles and bags. “Ocean of the Future” was shared with audiences on YouTube, Facebook, Instagram and Twitter. With more and more big brands and influential voices vowing to support the movement, here’s to hoping we can reverse the problem. Kudos to Greenpeace for one of the most striking set of visuals concerning plastic waste that we’ve ever seen. Animal rescue charity Battersea Dogs & Cats Home has undergone a complete brand identity revamp, changing its name to just “Battersea” and updating its design to be more playful and aligned with its core values. The design includes watercolour illustrations which highlight different breeds of cats and dogs. Design agency Pentagram was behind the new creative redesign, stating the new identity aims to communicate Battersea as a “compassion caregiver” and an “authority in animal welfare”. They also aimed to create a branding which strayed away from “shock-tactics” and sentimental wording, instead using honest and straightforward language. Battersea’s new branding succeeds in depicting its main values whilst remaining light, minimalistic and fun. We could have mentioned most of the trailers in the build-up to the highly anticipated Deadpool 2. Yet, the latest, including no other than David Beckham, is probably our favourite. The ad focuses on the cheeky mocking of David Beckham’s voice in the original Deadpool film. Beckham is shown repeatedly watching the insult on his voice before Deadpool himself shows up at the Beckham household seeking forgiveness. The trailer already has over 17 million views on YouTube since its release on the 10th May. This particular trailer is as amusing as the rest in what has been a brilliant year-long campaign from the Deadpool 2 marketing team. And that’s CreativeEye May ‘18 edition, filled to-the-brim with brilliantly creative masterstrokes. What do you think? Have we missed your favourite campaign of the month? You can let us know by tweeting us or getting in touch directly here.